Right now, I should be in the city at the Tommy Hilfiger Fifth Avenue Global Flagship hobnobbing with Mr. Hilfiger and other guests at the official opening night after party celebrating the Whitney Museum Biennial. Instead, I just finished doing the dishes and am now sitting in my home office reviewing today's progress on my book and finalized tomorrow's "To Do" list. It would have been fun to put on a beaded Milly cardigan, fitted DVF jeans and Be&D booties and show of my new LaLucca Giza clutch. 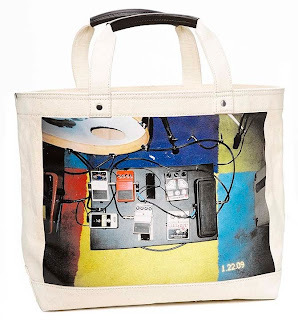 The art crowd would have loved the artsy, hand-painted bag. So goes the not-always-so-glamorous, bag-a-licious life that I lead. While I passed on tonight's glitzy festivities, I do plan to visit the Whitney Biennial exhibit. If you get a chance check out the emerging and contemporary American artists and do so this Saturday, February 27th, as Tommy Hilfiger will underwrite admission to the museum for the first 1,000 visitors (open to the public on February 25th through May 30th). Tonight's celebration is in honor of the sponsorship; it's also gives TH a chance to debut a limited-edition tote bag featuring imagery from acclaimed photographer and Biennial artist Ari Marcopoulos. The tote will be available at the Whitney and Tommy Hilfiger Fifth Avenue beginning tomorrow, with 50% of proceeds benefiting the Whitney Museum. Get yours for $98 retail. Use it as a beach tote or grocery bag -- it will certainly garner plenty of attention next time you're picking out tomatoes at the farmer's market in Union Square. Two weeks ago, I had the pleasure of meeting artist Peter Tunney, who's been gracious enough to host my companies upcoming Bag Some Art presentation for LaLucca Handbags at his Manhattan gallery. If you happen to be in New York City, check out the PT Experiment Gallery. Just minutes away from Central Park and a block away from Saint Patricks Cathedral, this vibrant space houses many of Peter's bold and graphic works, including a cheerful version of an eye exam over vintage 60s wallpaper (featured at right) and his famous "Don't Panic" slogan (seen below). If you're lucky, you'll get the chance to meet Peter himself or, even better, see him in action! After our meeting, I was really honored when Peter offered me a copy of his book The Peter Tunney Experiment and signed it with a very personal message: "4 the one and only blessed Pamela Pekerman, the time is ALLways NOW". We had just discusses the passing of my father, so the message really hit the spot. Thanks Peter! In addition to his artistic endeavors, Peter is very philanthropic and along with Maria Bello, Josh Brolin, James Franco, Jimmy Jean-Louis, Natasha Koifman, Diane Lane, Michael Stahl-David, Oliver Stone, Madeleine Stowe, Charlize Theron and Olivia Wilde sits on the advisory board for Artists for Peace and Justice. Take a look at the organization's website to see all the miracles they are doing for those in Haiti - and, yes, they were doing them before the earthquake! In light of recent personal events, Michelle and I have opted not to cover fashion week or attend too many events. I’ll hit up some key shows that I always enjoy – Michael Kors, Jill Stuart and Marchesa. Night events are pretty much out of the question – too much social activity at the moment without the safety net of real friends around me. But, I certainly won’t pass up on the Robert Verdi fashion week lounge and maybe the HauteLook suite, if only to catch up with my nice pr friends from Kaplow. What shall I do with my free time this week given the fact that everyone will be coordinating, emailing, scheduling, planning or writing something to do with Mercedes-Benz New York Fashion Week? Lots of smiling – everyone at the tents is always complaining about how horrible the schedule is and how tired they are. Enough! We are lucky to get paid to do what we enjoy and I always like to stress that if we aren’t happy how the heck does someone else feel at a s**ty 9-to-5 job? Live it up people. 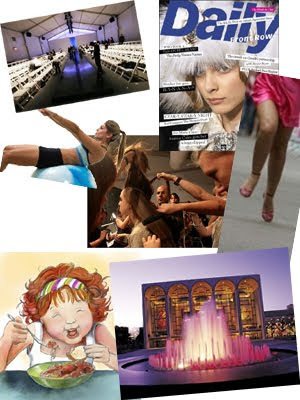 And, don’t forget I’m out this season, but I’ll Carpe Diem all over Lincoln Center come September 2010. For your fashion week fix check out what my friends Nola (fashion) and India (beauty) are doing at Glam.com. I finally started going out to work functions, and what better way to reenter than attending a twitter party hosted by Robert Verdi? I have Robert Verdi career admiration, so these events are a real treat. Since 2004 or so, I’ve watched him on TV and had the chance to interview him three times during past New York fashion weeks. To be able to attend his parties – at his stylish NYC pad – is a bag-a-licious perk. So what are these “Tweet This” parties? Well, it’s an ingenious business concept created by the Robert Verdi team where about two dozen influential tweeters come to his Lux Laboratory (the first floor event space above which is Robert’s personal penthouse) and hear about his favorite things for the holidays, valentines day, fashion week survival and more. As a guest, your job is to twitter throughout the event about the tips and products presented, and hash tag each tweet with #rvtips. The added bonus – on top of being there and having amazing access to my career ideal! – is that every item Robert mentions is gifted to the guests. I was in total shock the first time and felt like a guest at Oprah’s Favorite Things show, except this was the ear-to-ear smile, sunglasses wearing, best-bald-head ever Robert Verdi show (shameless plug here for Robert’s actual The Robert Verdi Show which premieres February 10 at 10pm on Logo - tune in every Wednesday for lots of laughs and fashion fun). RJ Graziano Lucite Bubble Necklace – I’ve already worn mine and had a modern, Betty Rubble moment. I found one one eBay for $79, but it retails for $44. Unfortunalty, it sold out on most online department store sites. DVF sunglasses – this is where I lost it because all things DVF are divine! This woman, mom, mogul and fashion icon is such an inspiration to me. I’d buy anything from her. The next Robert Verdi "Tweet This" party is February 12th. Don't forget to follow my tweets throughout the night - www.twitter.com/pamelapekerman. If you have a fashion or design question for Robert leave a comment here or tweet it to me. Have a room you want him to review just link to a picture. I'll be sure to share as many of them as I can!